Product descriptions and service offerings provided on Carrick’s websites may vary in different jurisdictions. Users should view the website by country. Alternatively, visit ‘Rest of the world’ regarding our global solutions. For Terms and Conditions, please click here. Carrick Wealth has done it again. For the third consecutive year, the Cape Town-based wealth management and investment advisory firm has won a prestigious International Adviser Best Practice Adviser Award, this time in the category for Excellence in Business Strategy. The annual awards are recognised as one of the international financial advisory industry’s most outstanding honours. This year’s winners were announced on 21 November at an impressive ceremony at the One & Only resort hotel in Cape Town’s Waterfront. Winning yet another award is a remarkable feat for Carrick, as it has won in each of the three years since the inception of the awards, while Carrick itself is only in its fourth year of existence. Last year Carrick won in the categories Excellence in Client Service and Excellence in Marketing and Client Engagement, and the year before it scooped up the honours in the categories for Excellence in Business Transformation and Excellence in Investment Planning. Carrick has now won in five of the eight categories that are awarded. The awards are hosted annually by International Adviser, a global information and research platform serving the financial adviser community, in partnership with Old Mutual International. Over the past 12 years, International Adviser has become known as the voice of the global financial adviser community. Winners are judged by their industry peers in recognition of their making or having made the transition towards best practice in six global regions: The United Kingdom, Europe, Hong Kong, Singapore, South Africa and the Middle East. “For us, as a young firm that has done exceptionally well in its first four years, to be honoured in this way by industry peers speaks volumes for our hard work, commitment to service excellence, and our founding mission to help transform the industry and establish new benchmarks for it,” said Featherby. Featherby himself was recently selected by International Adviser as one of their Top 100 most influential people in the global financial advisory industry. Since its founding four years ago, Carrick has shown remarkable growth in becoming a respected and dynamic leader in the industry. It has pursued a strategy of establishing a solid presence in key African markets to serve HNW individuals with avenues to protect, grow, and preserve their wealth. In 2016 Carrick laid out its Africa 2020 Vision, and is now registered and operating in South Africa, Zimbabwe, Botswana, Mauritius and Malawi, with pending approval in Kenya. Carrick’s Africa 2020 Vision will soon see the firm’s footprint broadened to include Nigeria, Ghana, and Côte d’Ivoire, Namibia and Zambia. 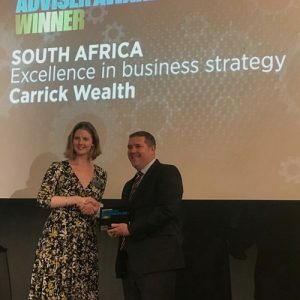 Carrick’s business strategy – which won it this year’s award – has further been informed by key factors that continue to transform and set new standards in financial planning and advice. These include re-alignment and meeting of the expectations of an increasingly aware and informed clientele, nurturing world-class talent and being a truly independent financial advisory, and embracing regulation and good corporate governance. Subscribe to our newsletter to receive the latest financial news and insights. © 2019 Carrick Financial Services. All Rights Reserved.